During Ramadan, every hotel and restaurant in Dubai publicises its iftar feasts, but we don’t often hear about Suhoor; strictly speaking the meal consumed by Muslims just before dawn, and the last before the daily fast. However nowadays, you can enjoy the tradition of Suhoor from as early as the evening before, so FooDiva’s bringing you a top three round-up of Dubai’s Suhoor delights. I would also encourage you to read this beautiful rendition of breaking the Ramadan fast by Anissa Helou reporting from the U.A.E for US foodie magazine, Saveur. Well naturally Atlantis would showcase Dubai’s most flamboyantly Arabesque beachfront tent, Asateer which translates to myths. 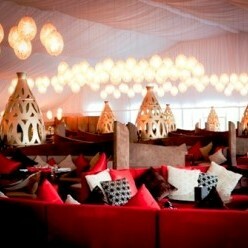 Aside from table seating, there’s eight Majlis areas – with their very own playstations. Well we are in Dubai after all. Oud and tableh players provide some background entertainment if you get bored of playing chess, backgammon or card games. Oh and free Wi-Fi too. The a la carte Suhoor menu of traditional Arabic dishes is served daily from 9pm to 3am. A minimum spend is applied; weekdays AED75 per person and weekends AED100 excluding shisha. This venue is hugely booked up, so make sure to reserve well ahead. Royal Mirage has always impressed us Dubaians with spectacular, star lit creations and this year doesn’t disappoint. The Arabian Court hotel’s Peregrine Garden has been transformed into a sumptuous, billowing yet boutiquey Arabian tent. Fully air-conditioned of course. A la carte Suhoor is served from 8pm to 2.30am. AED45 per person cover charge. You don’t have to head to a five star luxurious hotel for a true Ramadan experience. One of FooDiva’s fave year round Middle Eastern encounters is Almaz by Momo on the top level of Harvey Nic’s in Mall of the Emirates. And frankly one of Dubai’s best kept secrets, even though come evening the place is usually rammed. Tis the brainchild of Algerian born Mourad Mazouz, of London celeb haunt Momo; his nickname by the way, with Almaz translating to diamond. Well it certainly is my best friend. The hugely atmospheric Morrocan eaterie is divided into four sections; the main restaurant, the salon, juice bar and shisha room. Best bit for Suhoor, you can order delicacies from their normal a la carte from 9pm to 3am. Try the harissa soup, goat cheese filo pastry parcels and kofta tagine topped with a single baked egg. What’s your favourite Suhoor dining experience?